Tiggly Story Maker: Build Words and Record Your Own Tales makes creating three-letter words (with the CVC pattern) fun. Two consonants sit on the bottom of the screen with a space in between them. The five vowels dangle above the space. Kids drop a vowel into the space to see if they can make a word. If a word is made, the animated object appears on the screen. If a word is not made, the vowel springs off the page. 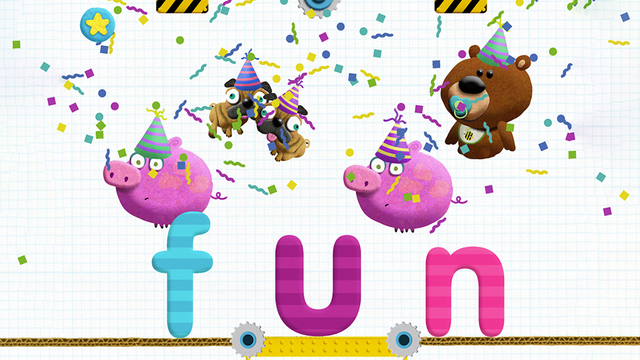 Kids can build more than forty CVC words with this app. In the process they will find more than 200 fun interactions such as pigs falling in love and pugs catching a cab. The app is great for reinforcing short vowel sounds and the CVC pattern. It would be a nice addition to a kindergarten or first grade classroom. Tiggly apps are unique because they can be used with or without Tiggly Word & Shape Toys which are available for purchase within the app. Using Tiggly Words Toys, kids can physically interact with three learning apps for the iPad – Tiggly Submarine, Tiggly Story Maker, and Tiggly Doctor. All three apps are currently FREE. Other Tiggly apps that are currently FREE include several math apps.